The very large kiln we’re building will require 100 or more sturdy shelves for stacking our pottery upon during the firings. These shelves are made of silicon carbide, and are able to withstand many years of firings in a molten environment . . . which also makes them fairly expensive. Shares are available in our online shop, or over the phone or via email. A few more details: You can purchase as many shares as you like, either for yourself, or as a gift for someone. (Weddings and birthdays?!) We will mail you or your giftee a certificate for the Kiln Shelf Share. Shares are redeemable at our Studio, or in our Online Shop at TwoPotters.com. (Your share can go toward shipping costs.) Shares will not expire, but can not apply to custom orders or offers of free shipping. Please be in touch if you have any questions. Thanks for supporting Community Supported Art! 2010 . . . what a year it was! Happy New Year, everyone! As I write, the studio is beginning to fill with new pots for the coming year, and our new four-legged "mascot" is busy with his favorite toy, so maybe I'll get a little written. I'm inspired to write a year-in-review style newsletter in part because I find that reflecting on all that we've done helps me stay inspired to keep going! Or maybe it's all those Christmas newsletters I just read . . . in any event, at this particular point in our lives, the project to-do lists can easily overwhelm, and it's nice to remember just how far we've come towards our dream. For the first six months of 2010, we were still traveling to my former studio in Eaton, NH, to make and fire our pottery. This entailed making pottery at our small rented studio in VT, packing it up while it was still green (i.e. unfired and fragile! ), loading it into the car, and traveling 100 miles over windy mountain roads to unpack it, load the kiln, and fire our wares. I recall one dramatic trip during a particularly rough frost-heave season where I arrived at the studio in tears, and several of my pots arrived in small pieces. All in all, though, we were grateful to still have use of the kiln, and enjoyed our "pottery camp" time together, beginning to collaborate and enjoy each others creativity. In February, my talented brother redesigned TwoPotters.com with our very own e-store, and it has been a great addition to our business! Around the same time, my new line of "painted pots" was born, springing from a desire to make and fire work in Vermont, and it was a lot of fun to share new tomatoes, carrots, peas, and flower designs at farmers markets and shows. In May, with help along the way from all four of our parents, we finished building an addition to our Milkhouse Gallery, just in time for our first experience on the Vermont Studio Tour on Memorial Day Weekend. We had loads of happy visitors who toured our kiln site, and watched Nathan do throwing demonstrations on the kick wheel. Needless to say, we'll be participating again in 2011! We began working on the new kiln in earnest in June, doing some more site drainage and beginning to lay the concrete block foundation that will carry the weight of oh-so-many bricks. The summer ensued, and between kiln work, we traveled to Maine for the Clam Festival Craft Show, and to Mount Sunapee for the League of NH Craftsmen's amazing Annual Fair. Both shows were wonderful; it was so much fun to see so many of our loyal friends and customers. Back in VT in late August, we continued to lay block, pour concrete, shovel sand and stone, celebrated our first wedding anniversary, and took quick trips to the river and for ice cream on the hottest of days. In early September, we spent 5 big days dismantling the Eaton kiln, and transported it to VT in thousands of heavy pieces. The bricks were put to immediate use as we began to lay the insulating floor of the wood kiln. The fall brought a big harvest from the garden, and beautiful weather for our Columbus Day Weekend Open Studio event that we spent with old and new friends alike. We began to get scrap slab wood delivered from a local mill to season for next year's firings, and moved bricks, bricks, bricks. Work on the kiln continued until it became clear that what we really needed more than anything was a new roof on our house! Thanks to our amazing friend Bob and some unseasonable warm, dry November weather, our 160-year old farmhouse got a much needed rebuild. That project took us right into early December, when we traveled to Eaton for the last time to officially move out of the house and studio. We packed up our pottery wheels, tools, materials, and clay, and moved them into storage in VT until we can build a studio of our own! 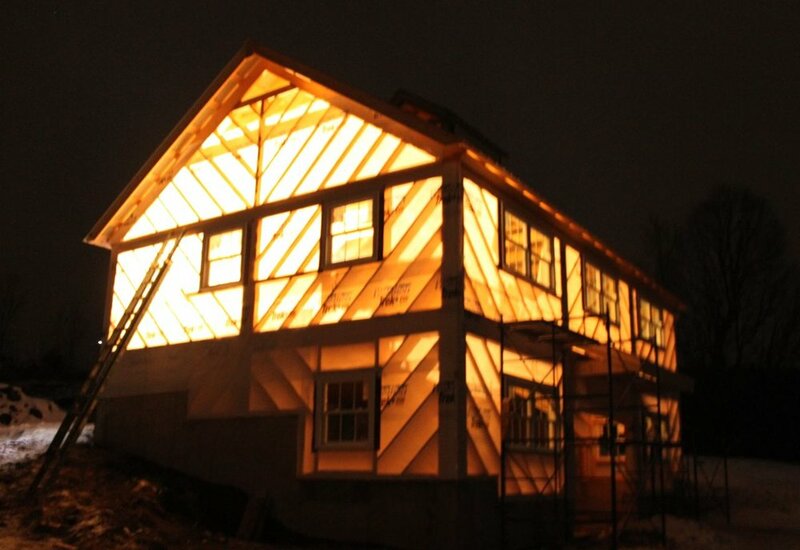 The day we returned the rental van, we got our new puppy, Lego, and last but not least, thanks to Efficiency Vermont, we illuminated the kiln shed and gallery entrance with super-efficient LED lighting that will make night-time kiln loading and stoking a breeze. Phew! We hope this newsletter finds you enjoying the fall colors! First and foremost, a huge thank-you to those of you who visited us at our various fairs, festivals, and farmers markets. We were excited to show our new work together, and it was a great year! It's now time to buckle-down on the home front, focus on building our new kiln, and plan for a proper studio next year. KILN BUILDING: It's starting to look like a kiln! We finished the climbing foundation work at the end of August (phew! ), and have been putting in long hours laying out the floor. The floor includes two layers of insulating brick (to prevent the concrete foundation from exploding from the heat!) topped with a layer of hard brick where we'll stack shelves of pottery. It's somewhat slow going, in part because we're building some air channels into the sub-floor to help burn wood used during side stoking. Once the floor is layed out, we'll build various mini-arches as flues between chambers, and then build a giant arch of plywood and lathe to hold up the brick walls until the arch is self-supporting. The long and short of it is: good progress, still a long way to go! You can see more photos here. THE END OF AN ERA: It's hard to believe, but the kiln in Eaton, New Hampshire, that started it all for Becca has been dismantled! In a somewhat emotional five days of very hard, hot work, we unstacked the large gas kiln at Becca's first studio, brick by brick. For almost two years now, we have been traveling to NH to make and fire our pottery. We knew this wasn't a long-term solution, and after we had unloaded the last pieces of pottery needed for our summer shows, we knew it was time. The real reason behind the dismantling was the desire to recycle the thousands of bricks in our new kiln. You can read more about this process and see photos in Becca's blog post about the big event below. EXCITING TIDBITS: Nathan has been accepted into 500 Raku! This is his second book acceptance in six months; we're awaiting the release of 500 Vases, by Lark Books, due out this fall. Also, we will both be appearing in the Cup and Mug Invitational, an exhibition at the Artisans Gallery in Northampton, MA, opening in November 12th- December 31st. NEW BLOG: As you may have noticed, we're now hosting our newsletter on our new blog! We will both be blogging about all manner of things, including our kiln progress, our favorite pieces of pottery, our new work, and much more. Hope you can follow along!